This RADIOLA! finds it all so incomprehensible, among other things. RADIOLA! streams continuously from my Live365 station. What's this about a podcast? 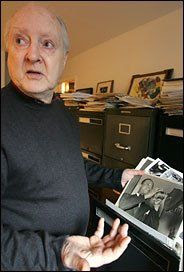 We were saddened to hear this week of the death of legendary reissue producer and photo archivist Frank Driggs. This RADIOLA! consists almost entirely of selections from compilations he produced. Fans of the sort of music played on this series owe him an incalculable debt of gratitude. He will be deeply missed. In 2008 my WHCL-FM colleague Pete Bianco interviewed Mr. Driggs and that interview may be found at this link. RADIOLA! as always streams continuously from my Live365 station. Podcast here. This RADIOLA! suggests that a pleasant surprise is better than the other kind. RADIOLA! streams continuously from my Live365 station. The pod is cast. Live on Stage! 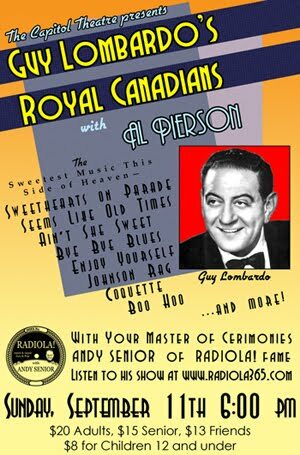 One of the legendary big bands of the "golden age" of popular music comes to the Capitol Theatre, playing such Lombardo hits as "Seems Like Old Times," "Boo Hoo," "Johnston Rag," "Bye Bye Blues," "Ain't She Sweet," and many others. 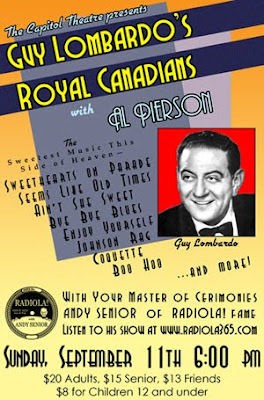 With your master of ceremonies, Andy Senior of Radiola! fame. Doors open at 4:45. With pre-show organ concert by both Mr. Senior and Capitol House Organist, John Paul. Free parking at neighboring parking lots, and at the Liberty-George Garage, courtesy the City of Rome. Adults $20, Seniors/Students $15, Capitol Friends $13, Childen $8. This RADIOLA! doesn't want vacation to end. RADIOLA! streams continuously from my Live365 station. Did someone mention a podcast? This RADIOLA! was moistened slightly by the recent storm but not saturated. Also we celebrate two excellent new releases on Bryan Wright's Rivermont label. RADIOLA! streams continuously from my Live365 station. Podcast here for the podcast-capable.